Madison, Wis. • For Kalani Sitake, last season’s 40-6 loss to Wisconsin in front of more than 61,000 fans — a thousand or so decked out in red — and a national television audience in Provo represented one of the lowest points of his second year as BYU’s football coach. Not only did the Cougars lose by 34 points, they were dominated in the trenches on both sides of the ball by the rugged Big Ten team, and winning those matchups was one of the former fullback’s stated goals when he replaced Bronco Mendenhall in 2016. “We were overwhelmed,” Sitake said. Having retooled his entire offensive coaching staff and adjusted his defensive coaches’ assignments to bring more of his desired toughness to the program, Sitake’s chance for redemption comes Saturday. The 1-1 Cougars will test the No. 6 Badgers at at Camp Randall Stadium in a rematch of that mid-September beatdown in which Wisconsin quarterback Alex Hornibrook set a school single-game completion percentage record (94.7 percent) and played flawlessly. Hornibrook had so much time to throw that he completed 18 of 19 passes for 256 yards and four touchdowns. Then-freshman Jonathan Taylor ran for 128 yards and a touchdown on 18 carries. Both are back, and Taylor is being touted as a Heisman Trophy candidate because he leads the country with 398 rushing yards in two games. The Cougars are 22-point underdogs, only the fourth time they’ve been predicted to lose by more than 20 points in the last 30 years. They were 21-point underdogs when they beat Oklahoma 14-13 in 2009, 29-point underdogs when they lost 31-3 to TCU in 2010 and 23-point underdogs last year when they were pummeled at Mississippi State, 35-10. Wisconsin’s powerful rushing attack and stingy defense likely will, though. The Badgers (2-0) rolled through Western Kentucky 34-3 and New Mexico 45-14 and will be playing their third straight game at Camp Randall, where they own a 41-game winning streak against non-conference opponents. “It gets your blood pumping on a Monday, knowing you gotta go to Madison and play those guys,” BYU offensive line coach Ryan Pugh said. Despite the beatdown they delivered last year, Hornibrook, Taylor and Wisconsin coach Paul Chryst have said all week that this is a different BYU team, and that Mangum missed the 2017 game. Beau Hoge, now a running back, filled in and was ineffective after a couple first-half drives that resulted in field goals. (Chris Detrick | The Salt Lake Tribune) Brigham Young Cougars quarterback Beau Hoge (7) is chased down for a safety by Wisconsin Badgers linebacker Tyler Johnson (59) during the game at LaVell Edwards Stadium Saturday Saturday, September 16, 2017. Wisconsin Badgers defeated Brigham Young Cougars 40-6. The Cougars can only hope it is. New offensive coordinator Jeff Grimes faced Wisconsin several times when he was at LSU. 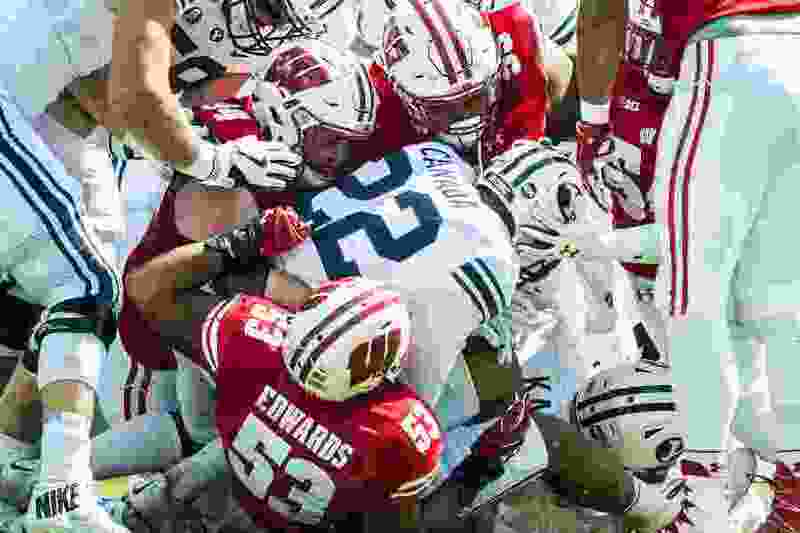 He’s spent the week trying to figure out how to move the ball on the Badgers, after the Cougars sputtered against a lesser defense last week in the 21-18 loss to Cal. 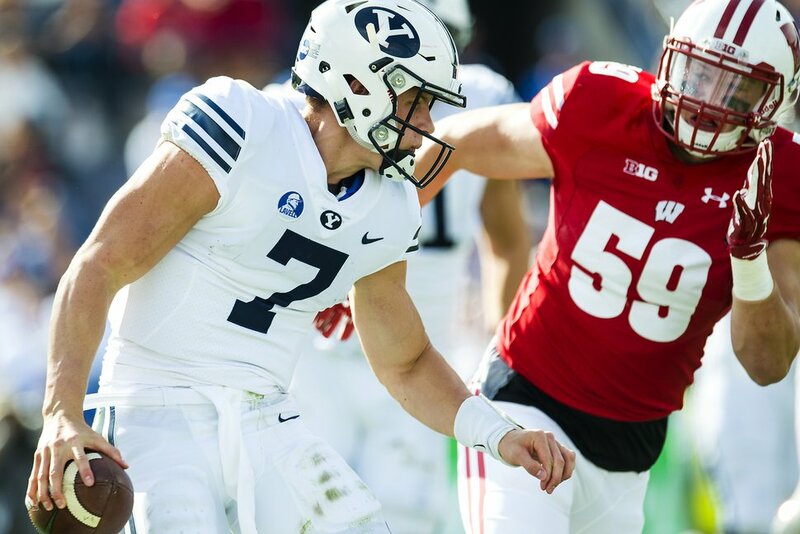 BYU offensive lineman Tristen Hoge referred to the Badgers as “those hard-nosed buggers” and said Wisconsin is the gold standard for offensive line play. Mangum said the coaches have pumped loud music and noise into practices this week in an attempt to replicate the atmosphere at 80,000-seat Camp Randall, including the “Jump Around” song by House of Pain (appropriately) that has developed into one of the great traditions in college football. Officials play the song at the end of the third quarter, and almost everyone in the crowd jumps up and down. It feels like an earthquake in the press box of the 101-year-old stadium. If he’s still saying that after the game, Sitake’s reconstruction plan will be on track. At Camp Randall Stadium, Madison, Wis.
About the Badgers • They are 47-10 since the start of the 2014 season, a .825 winning percentage that is topped in that stretch by only Alabama, Ohio State and Clemson. … They own a 41-game winning streak in nonconference home games, the fifth-longest such streak in the nation. … They have 20 straight regular-season games dating back to Oct. 22, 2016. … RB Jonathan Taylor is averaging 199.0 yards per game and leads the country in rushing with 398 total rushing yards. About the Cougars • They have not defeated a ranked team since beating No. 20 Boise State 35-24 in 2015. … They are 2-0 in their last two road games in the Big Ten, having downed Nebraska in 2015 and Michigan State in 2016, and are 5-9-1 all-time against Big Ten opponents. … They rank 105th in the NCAA in total offense at 339.5 yards per game and 62nd in total defense, allowing 362.0 yards per game.